Lake view at boarding house Čarman Bled is one of the guest houses located directly across from the lake where its guests can have a swim from the private pier infront of the house, they can hire a wooden rowing boat to visit the island or they have a ride around the lake with tourist train. Furthermore, there are alsoa Tourist Information Point and an Ethnogallery of local arts and crafts on the premises. Closeby are two restaurants as well as a grocery store. 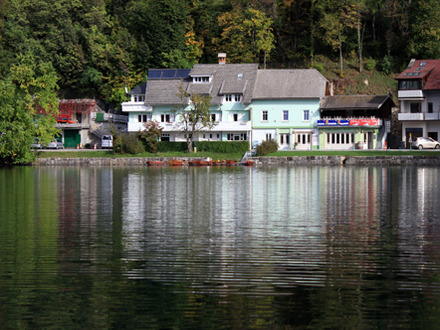 Čarman boarding house Bled offers rooms with the view on the lake with island and the rest of the beautiful landscape. Free Wi-Fi in room.